shmups.system11.org • View topic - New Scanline generator SLG3000 - available now! New Scanline generator SLG3000 - available now! Post subject: New Scanline generator SLG3000 - available now! - What is the SLG3000 ? The SLG3000 is a small PCB which allows you to display CRT'esque scanlines on VGA CRTs, LCDs or Plasmas displays. The SLG3000 has a VGA input and a VGA output connector, a potentionmeter to adjust the scanline density and a few dip switches to adjust to the source signal's sync polarity. An on/off switch can be attached using screw terminals. - Who created the SLG3000 ? Winfried Ellenbeck (winni) and Jochen Zurborg (bencao74) from Germany. - Where can I order the SLG3000 ? Either from Jochen's page ( http://www.arcadeforge.de/ ) or via PM to bencao74. - How much is the SLG3000 ? It's 49 EUR plus a very affordable shipping rate. - What about the plexi casing seen on top ? Jochen's offering transparent and black plexi casings starting march 2011. See pages 14+ in this thread for details. The cases are EUR 15 plus shipping. Readily assembled SLG3000 units are available as well for a little surcharge. - Which sources will the SLG3000 work with directly ? Everything that outputs VGA with a scanrate of 31khz or higher. This includes videogame systems like the Dreamcast or the XBox360 or emulation PCs with a standard graphics adapter. - What about 480p from component outputs ? If you have systems like the XBox 1, GameCube or PS2 you can transcode the signal from 480p component to VGA before feeding it into the SLG3000. Transcoders like these include the Neoya X2VGA or converters from Audio Authority or Kramer. A cheap (and good) one is the Lenkeng PSP scaler LKV7000. - What about 480p from HDMI outputs ? If you have a nettop for emulation which only has a HDMI output (or a system like the PS3) you can use a HDMI to VGA converter like the HDFury to feed the SLG3000. - What about 240p or 480i from classic videogame systems ? - Faroudja-based processors like the Videon Omega One or the Holo3DGraph capture card. - What if I don't have VGA inputs on the television set ? You can convert the SLG3000's output either to component using a VGA to component trancoder (e.g. this one http://www.newegg.com/Product/Product.a ... 6817707073 ) or you convert VGA to HDMI using a converter like the Gefen VGA to HDMI Scaler. - Are the results worth the trouble anyway ? Last edited by Fudoh on Sun Feb 27, 2011 6:17 pm, edited 6 times in total. If it has a simple on/off switch to let is simply pass through the signal as well, I would totally pick up something like this for the 360. Yes, on/off as well as dip switches for 25/50/75/100 intensity as planned! OK this is awesome news. Day 1 buy - 3pcs. What does this have to do with the Flame Meister? The Flame Meister (I love saying that) is HDMI only, and this is a VGA scanline generator. At least I think it's HDMI only. What happened? We went from carefully hunting for old equipment to new product releases catering to our needs. I'm not complaining, bring it on! When and where does this go on sale? What does this have to do with the Flame Meister? it doesn't anything, but if the Flame Meister doesn't provide scanlines, you can still use a HDMI to VGA connection (converter) to go through such a device. instant buy yes please can't wait. YES! This is exactly what I've been waiting for. Day 1 purchase if it's reasonably compact. According to the German text it's a simple analog device. It just switches every second line to black, very simple but effective, if you don't mind, that it won't look like real 15kz scanlines. Perhaps this can finally put an end to all the "this port lacks scanlines" nagging. You can already play Chou Ren Sha with scanlines using an X68000 emulator, not the Windows binary of the game. This is all Mame does for scanlines, and looks like regular scanlines to me on my tri-sync arcade monitor. looks like there's more than mere scanlines going on here. Aperture grill? dot mask? It looks that way. Seems to be the more standard with crt television so that pans out. The problem is that I don't think it's a transcoder device at all which is a shame because resolutions boosted by x3, x4 would do a great deal to make the scanlines more authentic like a true native display. I'm just glad this is the closest we can get so far. I didn't know SailorSat was on that board. Too bad I don't have a german to english translator outside of google acting funny. The screenshot were taken on a CRT without scaling. What you see besides scanlines is native to the display and not generated by the device. can't agree on that. A 480p feed to a 1080p display looks closest to a native CRT image (to me). Any prior scaling adds too much sharpness. Last edited by Fudoh on Mon Oct 11, 2010 10:11 pm, edited 1 time in total. Yeah you might be right on that. I was so used to running custom overlays with my own RGB or "fake" patterns on scaled images and they were maxed on bilinear filtering. I figured if you were to use a connection of lower grade then VGA (component might be suitable), it would add the right effect needed to keep it as natural as possible. Kingbuzzo: I took a second look at that photo album and concluded the RGB pattern is typical aperture grille. Good thing too because it maintains the Phosphor effects to make it convincing. I just reminded myself that I could probably use this for Bangai-O and MvC2 which I asked about awhile back. Too sweet! Any idea when is the planned launch for this device? Switching every other line to black is what the XRGB does as well I believe, but why wont this look like real 15khz scanlines? I am talking on a CRT monitor of course. I was talking more about LCD/Plasma there. 31khz scan lines and 15khz scan lines do look very different on CRTs though. On a CRT it can look like 15khz scan lines. But this depends vastly on your CRT. Good 31khz/VGA CRTs have awful scan lines, as their focus is on having a crisp, very sharp and detailed picture, those are called grade A or class A tubes. While arcade Cabs tend to have class B tubes. For low res 2D those class B tubes look better to most people. A scanline is a thick blank space between displayed lines of graphics, correct. So an XRGB connected to any CRT displaying a 240P image will have every other line of its 640x480 resolution not display anything. Isn't that the same as the cathode electron canon skipping that line when making it pass across the screen, just like an arcade cab would when displaying native content. So where is the difference exactly? I dont understand why A and B type monitors can make a difference in areas where nothing is being displayed. Do you rather mean that the displayed lines are more blurred on arcade monitors whereas being too sharp on a computer monitor? 31khz CRT tend to bloom less, so scanlines appear stronger on those. Unless you use very high resolutions to emulate a 240p picture (e.g. 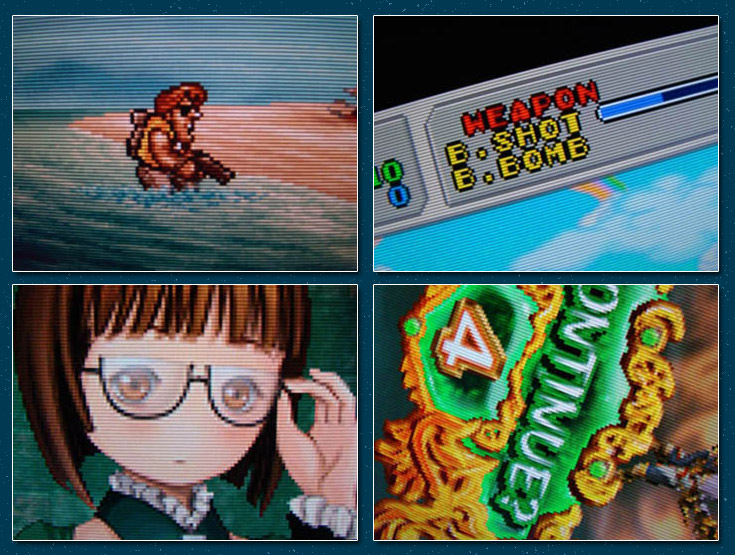 1200p), darkening every 2nd line on a 480p picture is the best method to "emulate" scanlines. I see, well ignorance is bliss as they say, games look fantastic enough on the CRT I am using, certainly worlds better than anything I can get on a LCD. A straight CRT monitor has its advantages in that it comes in a easy to carry container whereas arcade monitors are naked if I am not mistaken, so you have to find a big arse cabinet to put them in. Not to mention that even if I did get a arcade monitor I would have to ditch that XRGB and look for a reverse interface. And of course, that CRT monitor cost me the exact sum of nothing, you cant beat free, certainly not when it looks this good. I'm waiting for the day we can emulate proper scanlines including shadow mask. Add to that a VP which can simulate very fine bloom without input-lag and I'm sure the results would get pleasing enough to get rid of the bulky CRT without too much remorse. Im Winni, the technical developer of this device. I v had some probs with the f~~~~~ confirmationcode, but here I am! If anyone has a question, technical, I would try to answer. Jochen and I are ready to start the produktion of this amazing little device. To prevent any malfunction, I would be happy to hear (read) your wishes and demands. At this time you all can have an effekt to the details of developing. I m not incompetent, I m nocturnal active! 1. (already suggested) Use female VGA connectors on both sides of the unit. 3. Nothing too special, more of a luxury problem You decided for 0/25/50/75/100% scanlines via dip switches now, right ? I already hear people complaining that one setting's too weak while the next is too strong, simply because they're used to the inbetweens from other devices. What do the dips do ? Enable and disable various resistors I guess ? I would add ONE poti before or after the dips to set the "100% level". One could argue that a poti could replace the dips completely, but I feel safer with using dips than with turning a poti often. If you're going for a encased PCB, the poti could be added inside the case while the dips would be accessable outside. If you're going for a encased PCB, the poti could be added inside the case while the dips would be accessable outside. This sounds very smart. This way the pot is out of the way for novice users. Welcome to the shumps forums, winni! I was wondering if the dip switch setting is the only one being considered to this? I had some thoughts of a dial that can be used for adjusting the scanline quality manually rather then pre-sets which some people are complaining about.